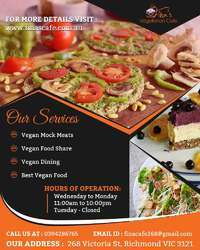 Finas Vegetarian is the hub of vegetarian vegan raw food! We know that there are lots of people who really want to know the reason behind organizing a vegan and vegetarian restaurant or a café. We had plenty of reasons such as our belief in consuming vegetarian food; providing options when you are on a vegan day out and so on. If you are looking for a vegan-friendly café, we are here to serve you. Our clients should take a look at our vegan menu before placing an order. Get in touch with us for an awesome experience and to eat delicious vegan delicacies. Also we are services provide Melbourne, Fitzroy, Richmond, Northcote, and Brunswick this aera.